Project manager Interior Design, reconstruction and remodel of entire interior Exterior design. The Churchill residence was a fairly straight forward remodel to a small “ranch” style house. It had space use issues which were reduced by building a new entry and reconfiguring the kitchen. After viewing the Frank’s home, the Churchill's asked me to design their interior in a similar style. Using a similar approach, we used clear finish wood cabinets, doors, trim, and floors. We created cross-vault ceilings in the living room and kitchen, installed a light well in the kitchen ceiling and incorporated stained glass lighting with their own stained glass entry panel creating a unique and luxurious home. Contractor Interior design, bath remodel, window seats, various finish projects. Exterior design and build several decks, a garden room, grilling area and staircases. The Sagen's residence was originally a fairly modest owner built home with a fantastic location, perched on a cliff about 40 feet above the Valencia creek. Over several years, the Sagens and I have remodeled their property with both interior and exterior projects that take advantage of the natural light and views of the creek and the Polo grounds We began their ongoing development with a bathroom remodel, replacing a 1/2 bath and pantry off of the kitchen with a full bathroom and shower. Contractor, Interior Design, reconstruction and remodel to kitchen, dining room and living room Exterior Design, entry deck and pergola, outdoor dining area deck and pergola, knee braces, window treatments and staircase. The Frank’s residence had several issues. The interior issues had to do with space usage and blocked sight lines in a small connected kitchen, living room and dining room. This was primarily due to having a 7’ wide shear panel in the center of the living space. We removed the shear panel and replaced it with two smaller panels which we hid in wing walls adjacent to the shear line. We were then able to incorporate the new light and views available into a complete remodel in a neo-traditional style. The exterior of the structure was flat, covered in brown shakes with little exterior structure to add dimension or color. 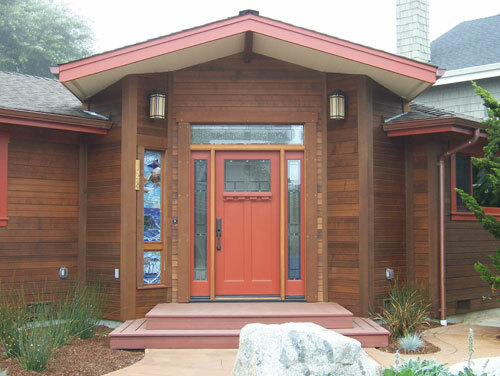 We designed and built an entry porch with pergola, a side deck and pergola for outdoor dining, an exterior staircase and added knee braces and window treatments to create an elegant “Craftsman” style appearance. 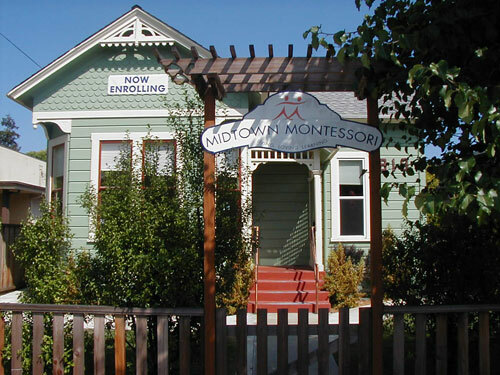 This project was the reconstruction and addition of to an historic 1870’s “Victorian” home and it’s conversion to a Montessori school for children, 5 years and younger. The owners had a limited budget and asked me to design the interior in a way that respected the design of the building while spending as little money as possible. After rebuilding the sub-floor structure and adding a office, playroom and back porch, we used “Sun-Tunnels” to bring light into the interior, added child sized toilets and sinks in the bathroom, installed painted baseboards and trim and inexpensive clear fir cabinetry. We used playful, springtime colors for the interior and exterior and created copper handrails. 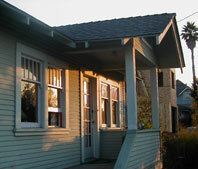 This project was ADA compliant and was given an award by the City of Santa Cruz for historic renovation. 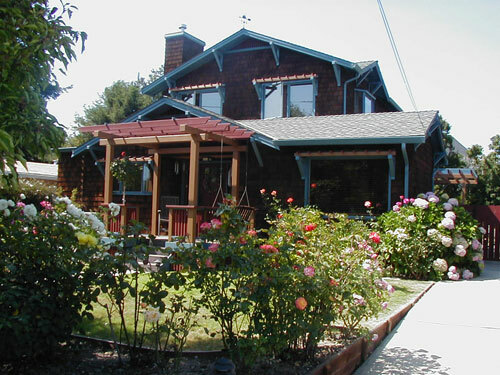 This was a 1920’s California bungalow with one bedroom, one bath and a sleeping porch that was used as a bed room. At 768 square feet, it wasn’t able to accomodate a family of four and because of its age it needed a remodel. We extended the house toward the rear of the lot, doubling it’s size to create a 3 bedroom, 2 bath home with a master suite that opens onto a open back porch and roof deck with views of the ocean. In the process of rebuilding the house, we were determined to retain the details of the original building style while accepting the age of the original house. We uncovered the original fir floors and extended them into the addition, installed wood frame widows, clear finished fir doors and a “Bungalow” style tile bathroom. We then used reclaimed red wood from the original garage to create a cathedral ceiling in the master bedroom and reclaimed custom milled redwood for the clear finished trim. The result is a home that is both lighthearted and traditional.